My father, who spent the first few years of his immigrant American life in New York, had forever after an antipathy for the place. To him the city was dirty, claustrophobic and depressing. Not so to his mother, my Baba, who remained an adamant New Yorker for forty years, despite little progress moving beyond the poverty line. To her, NY was a badge of honor, the Center of the Universe; a place where a 50 year old Russian woman, a non-English-speaking war refugee, with a brand new name could re-invent a life for herself, her half-blind feeble-minded sister and her hapless, traumatized 25 year old son, with his opportunistic German bride (who would soon leave for greener pastures once in America.) "I am from New York," Baba would intone in her imperious Slavic accent, the Russian equivalent of Hermione Gingold. And you knew by the way she said it, that it stood for something magnificent. Tho we passed thru NY on our way to California, I was four and haven't a single memory. My impressions of The City were mostly formed by movies (and to lesser extent TV); and the boastings of Baba during her infrequent trips to the coast. One such epic visit was in the summer of '62 while West Side Story was hovering in the zeitgeist like a radioactive cloud. I don't recall ever asking to go see the movie; I was only nine after all, and the patina of "gangs" and "juvenile deliquency" was probably as scary to me then as I'm sure my parents would have liked it to be. The movie was too Adult; that seemed clear even to me. But the music was everywhere. You couldn't escape it. Whether it was the ubiquitous soundtrack or one of countless "easy-listening" or jazz recordings; not to mention song cuts from vocalists of both sexes; it seemed to be playing somewhere at any given moment. And the thing is: the music was extraordinary. Complex, unusual, yet breathtakingly melodic and disarmingly accessible. OK, I'll say it: probably the greatest score ever written for a Bway musical. Even at nine, I knew it was sui generis. 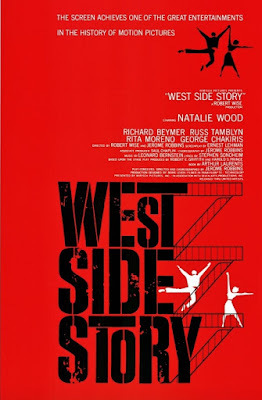 It came to me at first in pieces; a vocal here, a muzak version there; but I still recall a sense of amazement when I connected the dots and realized just how many songs were all from this one show, this "West Side Story." Finally, I bought the soundtrack one afternoon in the summer of '63, at Zody's--a mainly discount-clothing chain with a small record corner. All thru the '60s it seemed there wasn't a record store or department that didn't have the red album cover, with Saul Bass's iconic logo prominently featured on its walls. Thus my portal into the show (as I'm sure it must have been for countless others as well) was by placing needle upon disc and letting the album transport me to another world. I spent many weeks that summer lying on the floor of my air-conditioned bedroom hiding from the triple-digit heat outside, listening to the Bernstein/Sondheim score, conjuring my own fantasies of New York--divorced from the brutal context of the story; enhanced by the romantic sweep of the music. Inside the fold-out record jacket numerous stills from the movie haunted me. Why should these mean streets look so enticing and evocative to me? What did they evoke? Excitement? Energy? Romance? Baba? Why should I be pulled so strongly into a world far from the paradise my parents had so valiantly struggled to find in the newest edge of the frontier of Southern California? Years later, when I lost myself in the sharper definitions of the Bway OCR, I would imagine the gray, grimy street that Larry Kert runs along with Carol Lawrence on the album's cover, and dream I was there in 1957 with Robbins, Laurents, Bernstein & Sondheim as the show was coming together. Baba lived on the West Side, too--West 23rd St., then later West 141st (Spanish Harlem no less)--and this all fueled my fantasies of City Life; the urban grittiness a welcome antidote to the hermetically sealed suburban existence I so disdained, tho--unbeknownest even to me--secretly cherished. Thus WSS, the antithesis of The Glamorous Life, was for me a symbolic attraction. It wasn't the tenement streets I wanted to embrace, but the ground zero of professional creativity; where ghetto tragedy is transformed into beautiful music. Give my regards to Bway. Even for this point in time--the apex of the Golden Age of Musical Comedy--the 1961-62 season on Bway was particularly fecund. Late career works from the likes of Noel Coward, Dietz & Schwartz, Wright & Forrest and Harold Rome played alongside Bway debuts from Jerry Herman, John Kander, and Stephen Sondheim (as a composer). There were sophmore slips by Strouse & Adams, and Livingston & Evans; reboots by Richard Adler (post-Jerry Ross); Richard Rodgers (post-Hammerstein); and another page from the Styne, Comden & Green New York playbook; topped by the season's undisputed smash from Frank Loesser. All this running side by side with holdover hits: The Sound of Music, Fiorello!, Bye Bye Birdie, Irma La Douce, The Unsinkable Molly Brown, Camelot, Carnival! and the endless My Fair Lady, made for a thriving industry along Shubert Alley. 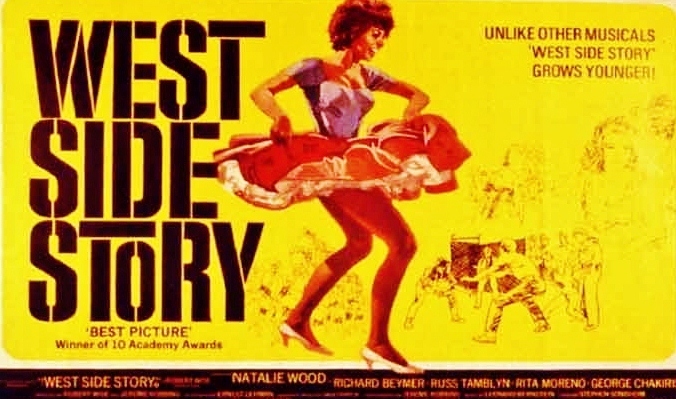 And still, beyond all this treasure, the biggest noise from Bway that fall came from Hlwd, when West Side Story hit the screen with the force of a hurricane. The chorus of dismissal (and there was a good amount) was buried under an avalanche of acclaim. It became, as The New Yorker, cheekily prophesized, "the Ben Hur of musicals." Who'd have thought it? Sure, it was a hit on Bway, but as a true coup de theatre, a one-of-a-kind mesh of music, dance and story with a tragic center; a lyric opera written in the idiom of musical comedy. Most prominently: a stage event, or as Sondheim has put it, a show, above all else, about Theater. How do you convey this on screen? Film producer Walter Mirsch was mad for the show, and thought he had the secret weapon: Jerome Robbins. Notoriously demanding, famously abusive, perfectionist Robbins, whose entire experience in motion pictures consisted of the "Small House of Uncle Tomas" ballet in Walter Lang's King & I--admittedly fine, but an inconclusive screen test. Yet his signtaure was indisputably all over WSS, and without Robbins the show would stand less chance of success in Hlwd. Still, United Artists thought fit to protect their investment by hiring a Co-Director; studio veteran Robert Wise. After all, hadn't Warners assigned Stanley Donen to oversee George Abbott? Bob Wise was, however, a stranger choice. For one thing he had no musical experience; nor was he quite the A-list helmer yet that Zinnemann, Preminger, or Mankiewicz were on their musicals. (His biggest hits up to then were the Susan Hayward melodrama, I Want to Live! and the soapy Executive Suite.) Wise was selected to oversee the dramatic scenes. Robbins had his hands full directing the musical sequences; mercilessly rehearsing his corps, and then endlessly restaging it all during lensing. But it's one thing to rehearse in a dance studio for an extra month, and quite another to hold up a major Hlwd production, running up overtime costs, falling behind schedule, and constantly fiddling with camera setups. Anywhere from 30-60% is said to have been completed before Robbins was fired by the Mirisch Bros.; tho by then all of the musical numbers had been thoroughly rehearsed if not filmed--and Robbins' assistants stayed to oversee the choreography. But his firing didn't exactly snap Bob Wise into a model of cost-cutting efficiency either; he took care to match the mood and quality of Robbins' scenes and even invited him back to assist in the editing process (and Wise knew his editing, having famously cut both Orson Welles' Citizen Kane and The Magnificent Ambersons.) The end result was a victory for both. Robbins, who never worked on another movie, received two Oscars for a film he was fired from. (A special award was given him for choreography) And to this day it remains the only shared Oscar for Best Director. Anointed with triumph, Jerry's next benediction, only days later, was to drop in on Sondheim's droopy tryout in Washington D.C; promptly diagnose the trouble and stage a new opening that forever put A Funny Thing Happened On the Way to the Forum on the map. Few had his Midas touch. 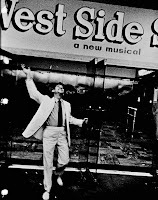 For his part, Wise made the jump to Hlwd's A-list with WSS, and would soon prove his own, unassisted mettle on another, even more successful, Bway adaptation. Robbins & Wise could have gone the way of Abbott & Donen and simply used the Bway cast, with one or two Hlwd replacments. Instead they took great pains in casting each role. Still a total of 14 veterans from the Bway & London productions were chosen, needlessly including the original Officer Krupke: William Bramley, who gives the film's least memorable performance. 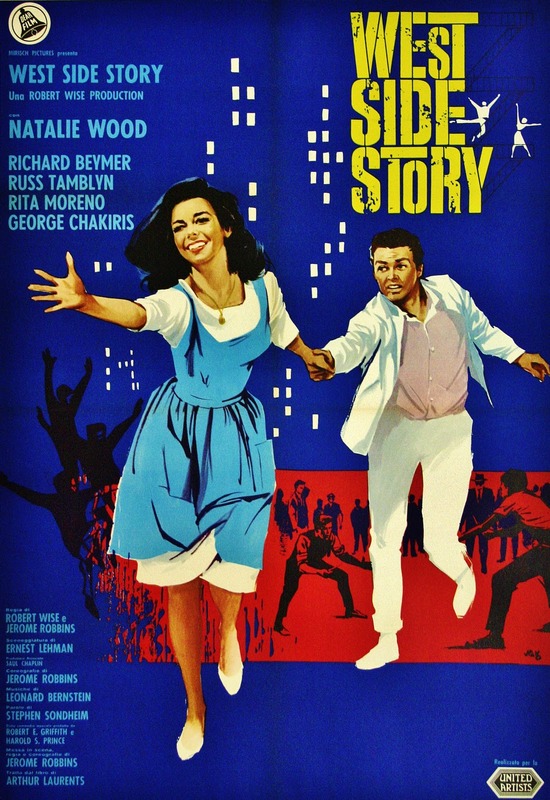 Of the leads, only George Chakiris had done the show on stage--and then as Riff in the London edition. For the film he was switched to Bernardo (oh, what a little makeup can do.) The excuse that Chita Rivera was too old for Anita by 1960 doesn't hold water, as she is actually a year younger than Rita Moreno. Of course, Rita had been drifting around Hlwd for years playing ethnic bits here & there--including the Burmese slave, Tuptim in The King & I--and under Robbins' direction. In other words, she had paid her dues, and here was the female Puerto Rican role of a lifetime, given to an actual Puerto Rican. (Chita, equally PR, had her revenge starring in another stage hit, Bye Bye Birdie--turning a character written for Carol Haney into a Hispanic American role.) Rita throws herself into the part, much as Dandridge did with Carmen Jones. ; finding the genuine spitfire within. Both she and Chakiris won Oscars; in part riding victory on the back of the film's sweep--certainly more so in George's case (was he really more memorable than Monty Clift as a victim of Nazi medical experiments in Judgment at Nuremburg? Or George C. Scott in The Hustler, or Jackie Gleason's Minnesota Fats in the same?) Rita's Oscar feels more earned, even with stiff competition from the forever Oscar-less Judy Garland as a feeble-minded German peasant woman in Judgment. WSS being a jazzed up Romeo & Juliet, the central roles, of course, are the lovers: Tony & Maria. Arthur Laurents originally wrote Tony with James Dean in mind. Sadly he was dead two years before the show, let alone the film, saw light. And here's one feeler that didn't go out to Sinatra. No, what was called for was a hot young turk. Who better than Elvis? Tho he (or Colonel Parker, take your pick) turned it down, (allegedly in part to shield his image from juvenile delinquency), it was said he later regretted it. Upon reflection Elvis might have been an interesting choice. Had he pulled it off, he'd have at least one classic film. Bobby Darin, who was chomping for a film career--and later had his chance at dramatic roles--was also considered; as were Tab Hunter, Richard Chamberlain, and Dennis Hopper. In the end the list was whittled down to a final five: Warren Beatty, Troy Donahue, Anthony Perkins, Russ Tamblyn and the ultimate choice: Richard Beymer, hardly a household hunk--but one who'd made a recent impression on screen as the spark of romance in The Diary of Anne Frank. Among those considered for Maria were Elizabeth Ashley, Suzanne Pleshette, Jill St. John (! ), Pier Angeli, Anna Maria Alberghetti (surely the most qualified), and Audrey Hepburn--who, like Sinatra, was reflexively defaulted for just about anything. Natalie Wood came in to read for Warren Beatty's audition--in support, as the two were then hot & heavy. Apparently they sizzled on film, but it was Nat who stole Warren's thunder. (She did as well with Beatty's film debut, in Elia Kazan's Splendor in the Grass, which opened only a week before WSS--signaling her graduation to adulthood, the Hlwd A-list and an Oscar nomination--already her second). Tho many might argue that Beatty would have been a better choice than Beymer (especially as most singing voices were dubbed anyway), Wood's casting mostly led to outrage and bafflement; most finding the modish Russian beauty an implausible San Juan native. But overlooking that; an inadequate singing voice, (dubbed by the versatile Marni Nixon) and an accent of varying quality, she's perfect. She certainly charmed the directors. Robbins took particular interest in Wood, one of his rare non-abusive working relationships--and she was crushed when he left the film. But no matter what qualms her critics cite, this role would forever seal Natalie Wood's image in the hearts of countless women (and men) as their iconic tragic heroine; much the way later generations would treasure Ali MacGraw in Love Story, or Kate Winslet in Titanic. And I suppose that's the case, too, for me. Tho I knew from the start that Wood was born "Natasha"--and found in her, a rare sense of Russian pride--she's acceptable, if not entirely convincing as Maria--but you can't really divorce her from the movie; she makes it what it is as much as anything else. I've always found her quite lovely to look at, and here she is a rose in full bloom--Juliet, after all. Beymer, with his lurid Li'l Abner lips, is a bit too glamour boy for my taste--and his Romeo-ish pining reeks of amateurism (imagine Beatty's underacting instead in such moments.) Curiously, too, Beymer looks no less ethnic than Chakiris--by his death scene he looks as Puerto Rican as anyone in the film (while Natalie looks as if she could step right into Doctor Zhivago). Surely Russ Tamblyn's curly blonde looks would've made a better contrast for Tony. Instead he was cast as Riff. The baby-faced Tamblyn had demonstrated some very athletic dancing in 7 Brides for 7 Bros, and a handful of other Hlwd musicals; a feat the directors trusted would trump his less than menacing presence. But he's so pleased with his standing backflips, landing so precisely in position, beaming like a merry tom thumb (a recent film role), that it undercuts his toughness. A former child actor, he'd proven his adult dramatic chops, scoring an Oscar nomination for Peyton Place in '58. But of course this is the film which tops his resume. Robbins brought some of his better character dancers in from Bway: Tommy Abbott (his assistant); David Winters, Tony Mordente; Tucker Smith, Eliot Feld & Harvey Hohnecker (later Evans)--all Jets. Chosen Sharks were Jose De Vega, Jay Norman, Larry Roquemore, & Gus Trikonis, and of course, Chakiris. Carol D'Andrea, and the other Trikonis, Gina (so many Greeks! ), were the only female Bway veterans. Aside from Chakiris, the Sharks aren't given much opportunity to make an impression on screen. The Jets are another matter, tho some get more focus than others. Tony Mordente (who met & married Chita on Bway, and was last onscreen in Li'l Abner) is front and center in most numbers--tho, in part, that may be due to his size (even with his pompadour, he stands a whole foot short of Tucker Smith). Eliot Feld makes a vivid impression as Baby John--a role outgrown by the original, David Winters, here graduated to A-rab. Feld's vulnerability was echoed off-screen when he caught pneumonia under Robbins' grueling demands. Later he would start his own dance compay--which was something of a big deal. A quick word on the Trikonis kids. I only know Gus because of a later gig where he danced shirtless with Chita Rivera in Bajour; He was also Goldie Hawn's first (pre-fame) husband. Unlike her brother, Gina, who later moved into wardrobe supervision, commands a good amount of screen time in WSS. With her Arianna Huffington looks and New-Yawk accent, she fascinates as Riff's g.f. Graziella. For other (adult) roles, Wise cast smartly. Simon Oakland makes the most of his street-weary NYCity cop; Ned Glass imbues Doc with a Jewish matyrdom (by the way, what kind of drugstore does he run, that stays open so late with no visible customers but for loitering Jets?). John Astin plays "Gladhand," an official who presides over a school dance as if he were in a completely different movie. That said, he's quite funny, turning a cameo into a impressive lesson in character acting, which doubtlessly put him on the radar of Hlwd casting agents, and soon a starring role in TV sitcoms (I'm Dickens-He's Fenster, then the original Gomez in The Addams Family.) The final major character is New York itself. 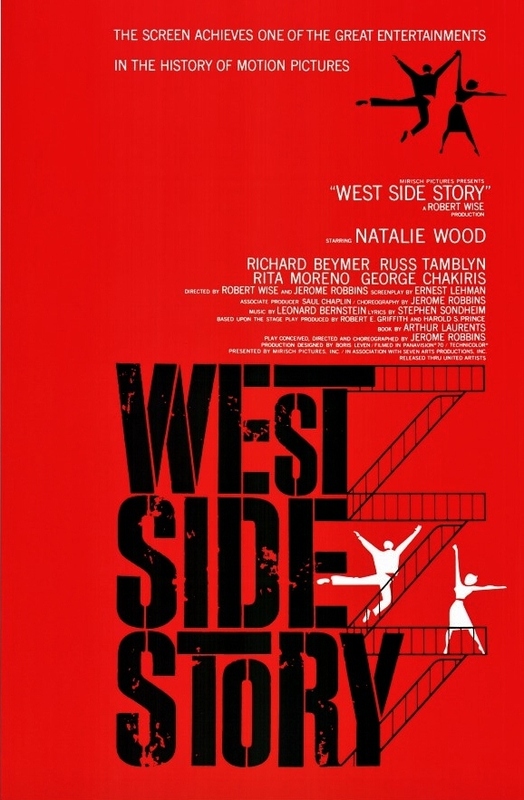 It seems as if the movie was shot entirely on location, but in truth, aside from the opening shots and the danced "Prologue," the rest of the film was shot on soundstages--not so different from Bernstein's previous NY-set musical, On the Town. But it's a testament to the art direction by Boris Leven, and the camerawork of Daniel L. Fapp (both would win Oscars) that the city looks so authentic--something MGM's Town didn't even attempt--many never noticed it wasn't. Oddly, it's the interiors here that look stylized; artificial--who ever saw a gym covered in blood-red walls? Or a drugstore whose interior screams gloom--or Maria's deep turquoise parlor, with its door of multi-colored glass--casting bold squares of primary colors on the chocolate bedroom wall. The Puerto Rican dress shop alone has a sense of never seeing daylight. Yet it all works on a purely emotional level. When the audience sat down at the Rivoli Theater on October 18, 1961, few expected the unique stage piece would become a cinematic milestone. Only a year before, the musical was still running on Bway, one block north at the Winter Garden--still fresh in the minds of many in the audience. But the film declared its difference promptly, beginning with an overture. The Bway production was one of the first musicals to dispense with one; to open cold on the curtain rise--a practice that would only grow in coming decades. For the film (at least in theatrical release) an overture served as mood setter, a taste of the aural goodies to come, and a reminder that above all else Leonard Bernstein's music is what propels this show into the stratosphere. It lifts off on "Tonight"--a melody that even detached from its lyric conveys a sense of thrilling anticipation like almost no other. The orchestrations are so clearly different from Bway; pumped up and Hlwd symphonic. Lovers of the OCR (and they are legion) were put off. But for those millions who came new to the movie, and soundtrack, there was nothing wrong to the ear. The film (not to mention the score) upholds the grandeur of a symphonic sound. But there's nearly silence as the movie proper begins; distant sounds of traffic, some faraway whistling, an occasional bongo beat and then those percussive finger snaps. Bob Wise eschewed the usual skyline views--as seen in countless NY-set movies, like the recent Bells Are Ringing--and instead pointed the camera straight down from above; finding a fresh, preternatural perspective on the metropolis. In 19 separate shots we get a decidedly non-postcard tour of the city's various moods and facets (was the theater district a deliberate ommission? ), before diving down into the belly of the beast: the brownstone slum on the verge of demolition for Lincoln Center. (Imagine if they had the old Penn Station to film Ragtime, or some such, before it was gone forever.) It was a coup of historic timing and artistic brilliance. What on stage was a percussive urban ballet, unchained to realism, was a challenge to put before cameras in a real environment. But Robbins meets that challenge brilliantly, drawing our focus on the Jets and their menacing neighborhood presence, then slowly, effortlessly, turning their movement into full-out dance. On the surface it looks silly, of course, but it's also audacious, and done with such conviction that soon enuf one is sucked into this most artifical behavior let loose in such gritty naturalism. In itself, Bernstein's "Prologue" is a remarkable piece of music, but Robbins' cinematic rethinking of the number was so breathtaking, so riveting, so radical that it virtually sold the movie at hello. As it stands, it's the best thing in the picture; which doesn't mean what follows disappoints. There are plenty more highlights, coming in regular intervals, and with most of them involving groups. Take the Dance at the Gym; even lacking Robbins' oversight (he was fired by then) the sequence never fails to mesmerize; a duel by footwork. (And how cool is it that the hippest dance these kids know is "Mambo!" --so fifties, and really out of date by the film's release, but no matter). The film is scrupulously faithful to the score, with but one exception: the "Somewhere" Ballet--which is the show's concession to the standard Dream Ballet. I don't believe it was ever intended to be in the movie, but I'm convinced, that given time, Robbins could have found a cinematic solution for the Ballet that was as clever and electrifying as his filmed Prologue. Original librettist Arthur Laurents wasn't shy about his opinion of the movie ("appalling"), nonetheless he participated in a celebratory documentary on its making. He doesn't comment on the numerous revisions in the screenplay, but it would be hard to ignore Ernest Lehman's improvements. The one most often cited--the flipping of "Cool" with "Gee, Officer Krupke"--was actually debated and tried during the show's creation. And tho Robbins acknowledged that logic would rule against a rattled gang performing a comic vaudeville, he knew it worked as a stage conceit. On film, it was a different matter. And because of it, both numbers are better served. The second act needed a comic breather on stage; on film it needs a burst of energy. Robbins gives it in spades; relocating "Cool" inside a garage with headlights illuminating the steam-pipe bursting movements of the Jets and their girls. It provides a real rouser so late in the evening, that I'm surprised it hasn't been retained for post-film stage productions. Likewise, "Gee, Officer Krupke" (of which sentiment and lyrics--if we're going to be honest--are far above the knowledge and self-awareness of these characters; to wit: "It's just his neurosis that oughta be curbed") plays to better advantage earlier in the story. Another show-stopper on stage, "America" is even better as an argument between the women and their men. Better, too, moved to a rooftop (isn't that how we remember it now?--yet on stage it was set in an alley); It's also been moved to fall between Tony's ballad, "Maria," and their duet, "Tonight"--breaking a long, potentially syrupy, sequence up with some vivacious action. It's hard enuf for a fella to enjoy a song like "I Feel Pretty," without irony or sheer embarrassment, but the tune is so damn lilting, I can't help myself. In relocating the song to before, not after, the rumble Lehman allows us to share unconditionally in Maria's joy; where on stage it was all the sadder for what we already know is a false hope. But that bittersweet moment is still here, later in a impulse rooftop dance as Maria awaits Tony's return. The show's ballads are the weakest served in the film, especially "Somewhere," which over time has become the show's signature tune. On stage the song led to a fantasy ballet, which was jettisoned here, and thus the song suffers from a quick verse, sung by Tony, without achieving the desired impact. Among the most dazzling of effects is the long dissolve from Maria twirling in the bridal shop to the Dance at the Gym; a twirl that melts into a spinning orange top, bleeds out into a group of dancers, then suddenly springs into focus. The scene was beautifully transitioned on stage too, with a burst of streamers from the rafters; but this is a prime example of translating stage effects into cinema. Others are less successful (i.e. the cloudy sides of the Panavision screen during parts of "Tonight," or the out of focus fade on the crowd when Tony & Maria meet at the dance) but for the most part this was such a thorough, deeply-considered translation to cinema, which is no small measure of why it thrilled audiences on its arrival; and became in time its own monument. For some, like Laurents, that is appalling. But for every derider there are ten more whose love outweighs the loathing. 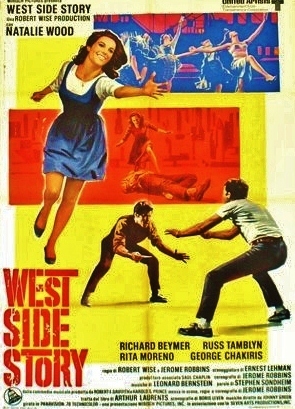 West Side Story played the Rivoli for 68 weeks at Roadshow prices--in LA it held over at Grauman's Chinese for 57 weeks, only then spreading out to local venues, amassing by the end of 1963, over $19,000,000 in film rentals--making it the 5th highest grossing movie (behind Gone With the Wind, Ben-Hur, The Ten Commandments & Around the World in 8o Days) in film history to that time. Surely no one had forseen this. I was a senior in high school before I finally saw the movie, in September of '69. It was on a second theatrical re-issue, (which pumped the total take to $25,000,000) and had still not been shown on television. Since moving from Canoga Park up to Cupertino at the start of that year, and getting my driver's license, my access to movie theaters had exponentially improved; particularly as adjacent San Jose fancied itself a city in its own right, raising a handful of mini-Cinerama Domes (Century Theaters) to house reserved-seat Roadshow pictures that were then coming out with steadfast regularity. These had effectively been out of my reach in LA, as my parents had long lost their willingness to venture into Hlwd for just a movie. (They even waited out the 21 months before Doctor Zhivago--surely an epic up their alley, if ever there was one--made it over the hill into the "nabes," as Variety deems the suburbs.) After years of listening to the score (both film & stage versions), the movie didn't disappoint in the least. Since part of my DNA contains the memory of diaspora, it was only natural for me to relate with the Sharks. Puerto Ricans couldn't be more different than Russians, but their great mirgration to America was concurrent with my family's arrival. Years later I saw the film again in NY, when I was living there--but a '70s NY was a generation removed from a '50s NY, and I emerged acutely saddened by the irrevocable passing of time. So much more time has passed by now, and I hadn't seen the film in 15 years--and having now viewed it four more times I'm forced to admit that whatever its flaws it remains eminently watchable. On a more peripheral note, mention must be made of the incalculable contribution of Saul Bass. The reknowned graphic designer had almost single-handedly contemporized the design of movie posters and credit sequences (particularly in his ongoing relationship with Otto Preminger). He was also responsible for the shower sequence in Hitchcock's Psycho--a filmmaker as well. Aside from his ubiquitous stencil-lettered fire-escape logo (as much a brand as the cursive script of Coca Cola--even Laurents felt compelled to use it for his revival's graphic) Bass was assigned an end-credit sequence--movies without credits up front were still rare in Hlwd; and for a musical this was surely a first. With an exquisite musical arrangement by Johnny Green that seemlessly flows from the final notes of Bernstein's urban requieum, Bass paints a fantasia of graffiti, spelling the credits on brick walls, abandoned doors, traffic signs. (Tho graffiti was still a few years away from developing into that which we're universally familiar with now). But the sequence, immeasurably helped by the music, is a balm to the senses; a chance to collect ourselves from the story's final impact without pushing us to a forced recovery. About that ending; it bothers me that Maria doesn't at least scream the moment Tony is shot. She is so calm thru-out until after he's dead and she gets hold of the gun, that it feels as if she's already processed the event, and is merely living out a predestination. Her famous spoken aria (try as he might Bernstein could never find the music for this moment, and so it remained a speech: "How many bullets are left, Chino?") 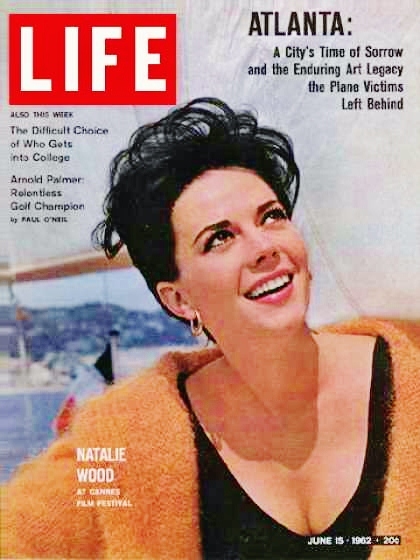 It's Maria's moment of reckoning and to Natalie Wood's credit she is better here than elsewhere in the picture. And yet, I still miss that scream. The film, not the show, put WSS into the international vernacular. Its style, its rhythm, its finger snaps have been referenced in countless forums; and show no sign of letting up--Glee just used it for the school musical. Mad Magazine did one of their movie hatchet jobs on it: a Yanks vs. Reds Cold War match at the UN: East Side Story (Issue #78, April '63)--with Khruschev & JFK snapping fingers in the General Assembly--"When you're a red you're a red all the way..." I was quite mad for it when I was a teen. The picture's imprint may be in part why the show hasn't enjoyed more frequent revival on Bway. The first wasn't till 1980--a faithful re-creation, but one that didn't catch fire. Arthur Laurent's much anticipated re-working in 2009 was more successful, bringing new audiences in for almost two years, but was something of a misfire in its bi-lingual concept--and poorly served by its approach from a dramaturgical focus. New recordings of the score come along with some regularity. A good deal has been written about the show over the years, and now still more with the film's 50th anniversary. An accounting of record-breaking statistics is easily found elsewhere, but there is one that most impresses and astonishes me. Tho the Bway recording justly spent 191 weeks on the Billboard Top 100 album chart, the film's soundtrack topped that by another 7 weeks. OK, fine, so what, you say...there are lots of albums that stay in the top 100 for months, even years. But the Soundtrack was at the top of the chart; the #1 album in America for fifty four weeks. And non-consecutively--meaning that it had legs like no album before or since. Hard as it is to comprehend in our current climate, but it was during the reign of Elvis that the Bway musical ascended to its peak of fame and influence on American culture. Even Hlwd could no longer deny its primacy: giving the film 11 Oscar nominations--and then, in April '62--awarding statues to every nominee but Ernest Lehman (who lost to Abby Mann for Judgment at Nuremburg). It wasn't merely the first Best Picture for a Bway musical, it was a rare victory for a stage transfer of any kind--the only two previous Best Pictures with Bway roots were You Can't Take It With You and Grand Hotel. Another 31 had been nominated, including this same year, Fanny. Fittingly, the 1962 Oscar show was produced by Arthur Freed, and the musical director was the film's conductor, Johnny Green--who ended up winning an Oscar of his own that night. 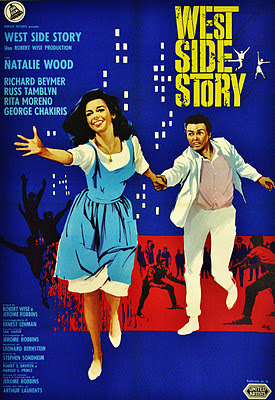 I confess that for a very long time I thought West Side Story was a musical without flaws. Alas, I cannot perceive it that way today. Laurents' book rides a fine line between poetry & kitsch; Sondheim decries many of his own lyrics; and Robbins made some mistakes in logic and continuity. But Bernstein alone, I think, is beyond reproach. There isn't one wrong note in his score, and this ultimately is what will keep this nonpareil musical alive for generations to come. Perhaps as lasting as Shakespeare's original. “America” “Dance at the Gym” "Quintet"
"I Feel Pretty" "Gee, Officer Krupke"
Art Direction, Film Editing, Sound, Scoring. My God. This is the best exegesis of a movie I've ever read. Also, one of the best love letters to a movie. You did amazing research. You cleared up a real fuzzy area for me around Robbins' involvement in and his firing from the movie. What I found most interesting was your personal attachments to and relationship with the musical itself as well as the movie. 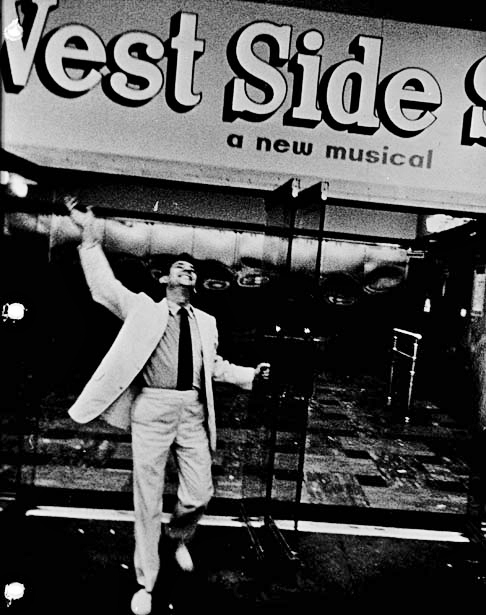 I was 14 living across the Hudson from Manhattan when West Side Story opened at the Winter Garden. It was a ground-breaking phenomenon. I ran to NY to see it many times. The excitement for me was that it was showing me the future of musical theater. 50 yrs later I wonder just how much of a legacy it really left. Maybe brilliance and perfection can be so intimidating sometimes it stifles follow-ons and imitators.